Kady Kepner is a Battalion Chief with the Los Angeles Fire Department. A 17-year veteran of the Fire Department she has been assigned to both administrative and operational commands in the LAFD. She is a strong advocate for providing education and training opportunities for our command officers. Her passion is to help mentor young men and women to become firefighters as well as our own members through the LAFD promotional process. Kady is involved with several community initiatives including working with the LAUSD, teaching disaster preparedness to young children. Chief Kepner is also actively involved with the Los Angeles Women in the Fire Service. She is a proven leader and is committed to bridging the gap between human relations and labor relations to ensure a more productive, comfortable and happy work environment. As the Secretary of COA, Kady has been instrumental in developing key policy recommendations as well as contract negotiations. She has a masters in Leadership and Management from the University of LaVerne, a bachelors in Sociology and Criminal Justice from Chapman University and an associate’s in Fire Science from LA Valley College. 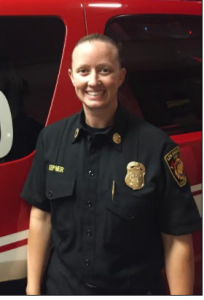 She is also a State Certified Fire Officer and a graduate of the UCLA Program Management executive course and the USC Public Safety Leadership Program.